Glenfield in Leicester is one of the UK’s leading hospitals for coronary care and respiratory diseases. 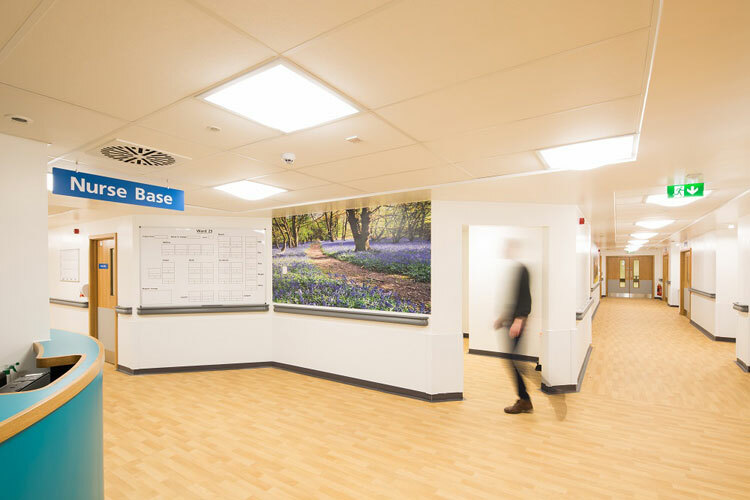 The hospital’s Vascular Services Department has been redeveloped to provide additional patient accommodation and services including a new Angiography Treatment Suite with a technically advanced Hybrid Theatre. 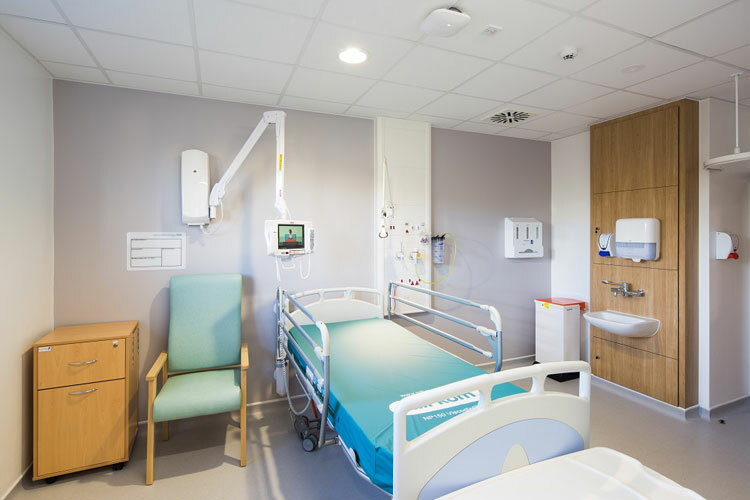 2,000m² Rockfon® MediCare® ceilings were installed throughout to meet the demanding specification requirements which included acoustic control, fire protection and hygiene. 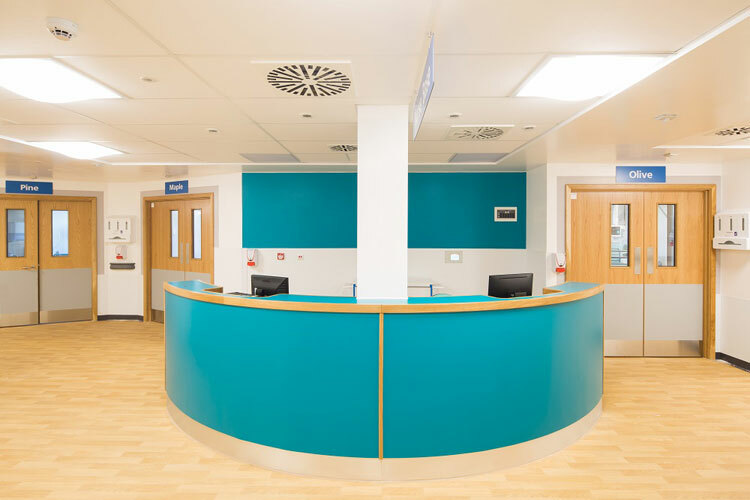 The University Hospitals of Leicester NHS Trust had an ambitious plan for Glenfield to become a Level One regional centre for complex endovascular services. 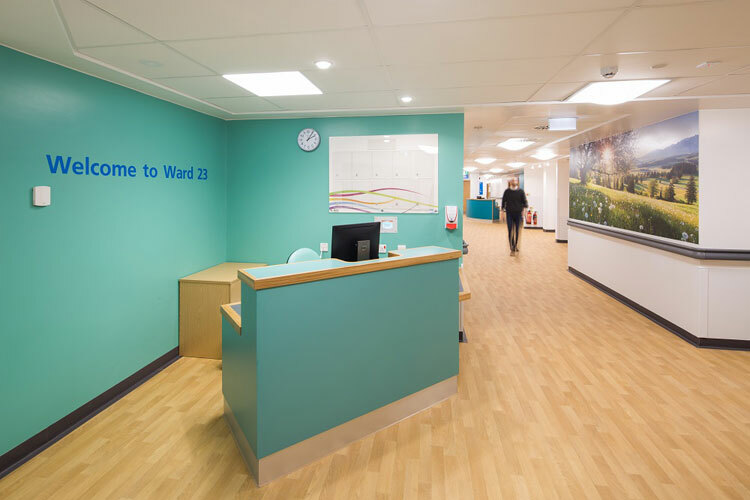 Due to the complexity of the project and the installation of significant mechanical and electrical services within the existing hospital service voids, the scheme was detailed and coordinated using Revit software in line with the Government mandate for the use of BIM Level 2. Regular meetings were held between P + HS Architects, the contractor and Rockfon to ensure design cohesion and a smooth on-site installation process. 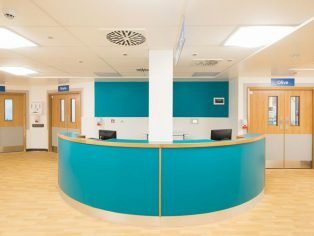 The durable, long-life Rockfon MediCare ceiling range has been specifically developed for use in healthcare environments. The tiles have an aesthetically-pleasing surface which can be easily cleaned and is resistant to all ubiquitous bacteria including MRSA. The Rockfon System MaxiSpan T24 A/E is a unique and cost-efficient installation system for corridors where the grid is suspended from the walls, removing the need for wire hangers. 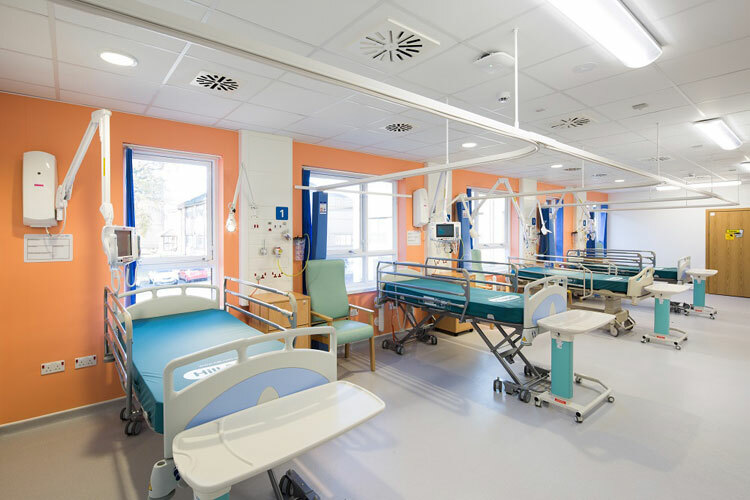 The system is perfect for corridors with heavily-serviced ceiling voids, providing more flexibility and freedom to install and maintain the services. Because fewer grid components are required than with a traditional grid, Maxispan is ideal for use with a variety of tiles including wide planks to create a more seamless appearance. 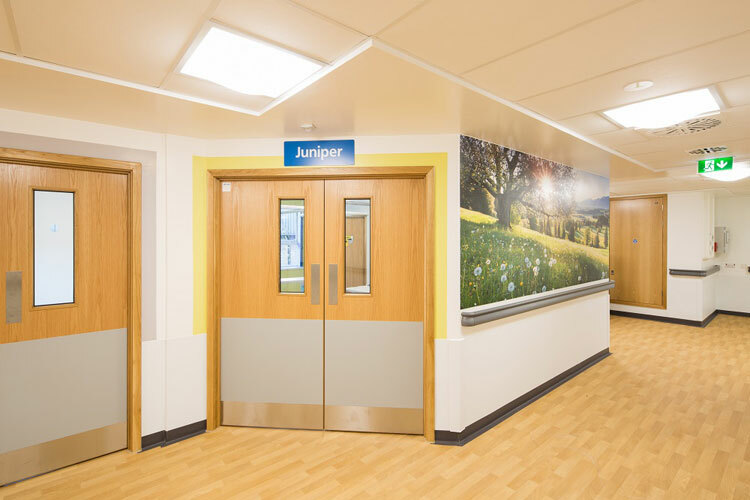 Rockfon® MediCare® Standard 1800 x 600mm ceiling tiles were chosen for the corridors. The wider planks are a perfect solution as it gives easier access to the services above. Its pleasing white surface offers high light reflectance to help maximise the lighting conditions along these essential passage ways. They offer the highest class of fire safety (Class A1) and can remain stable in the event of a fire, allowing staff and patients more time to evacuate safely. For the Angiography Treatment Suite, Rockfon® MediCare® Air was especially effective where differential air pressure is required to prevent the spread of infection. Rockfon MediCare Air benefits from having a high-performance membrane and sealed edges. Combined with MediCare clips, the ceiling can achieve an air leakage rate of less than 0.5m³/h/m²/Pa under a pressure range of 5 to 40 Pa. Rockfon MediCare Air also offers the highest safety (Class A1), excellent sound absorption (Class B) and is dimensionally stable at humidity levels of up to 100 per cent RH. 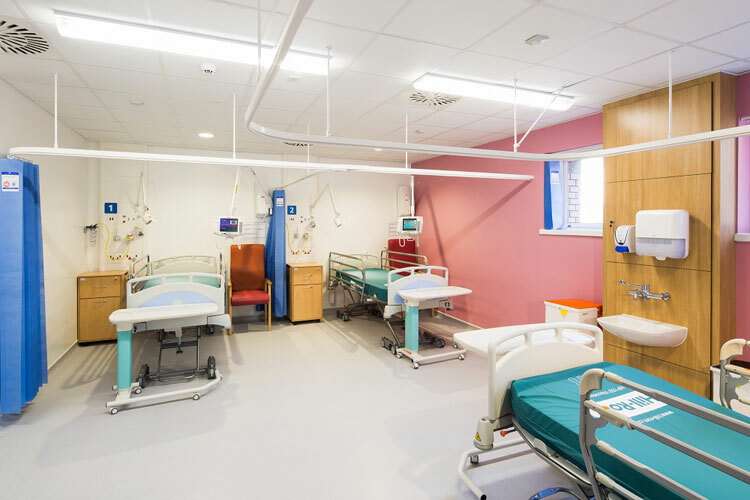 Rockfon® Medicare® Plus ceilings are ideal for demanding healthcare applications because they are durable enough to withstand specialist steam and high pressure cleaning. It’s for this reason they were installed in the general wards at Glenfield. All Rockfon ceiling tiles are dimensionally stable even at humidity levels of up to 100 per cent RH.